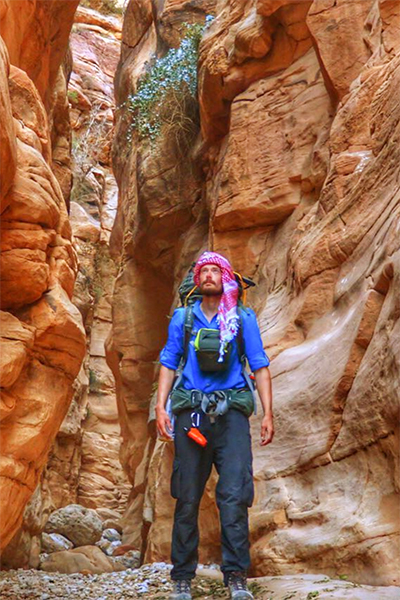 Leon McCarron walking through “monstrously deep” slot canyons his way towards Wadi Rum. Photo courtesy of Leon McCarron. 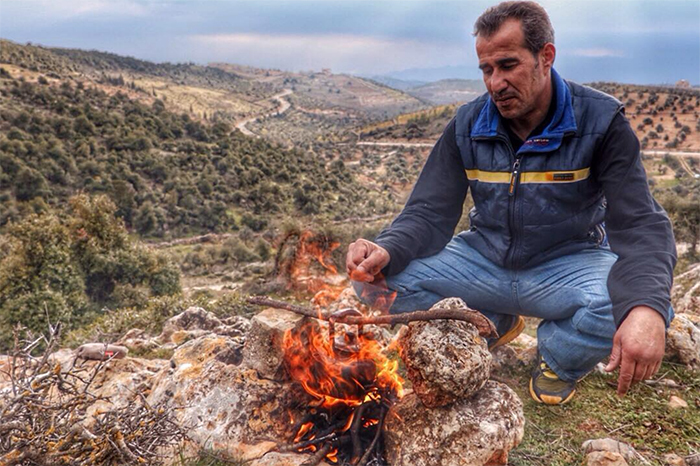 Leon McCarron FRGS is an adventurer and storyteller, who has used both the mediums of video and text to vividly convey aspects of his journeys and a tangible sense of the places and people he has encountered along the way. In May 2012 Leon concluded a 6-month, 3000 mile expedition walking the length of China, from the Gobi desert in Mongolia to South China Sea in Hong Kong. National Geographic produced a 4-part TV series of the journey. Later in 2012 Leon crossed 1000 miles of the Empty Quarter desert, roughly following the route of explorer Wilfred Thesiger and pulling a cart loaded with supplies. This was an adventure alongside Alastair Humphreys, another previous guest on my podcast. Other journeys Leon has completed include a 14,000-mile solo and unsupported bicycle trip from London to Hong Kong. 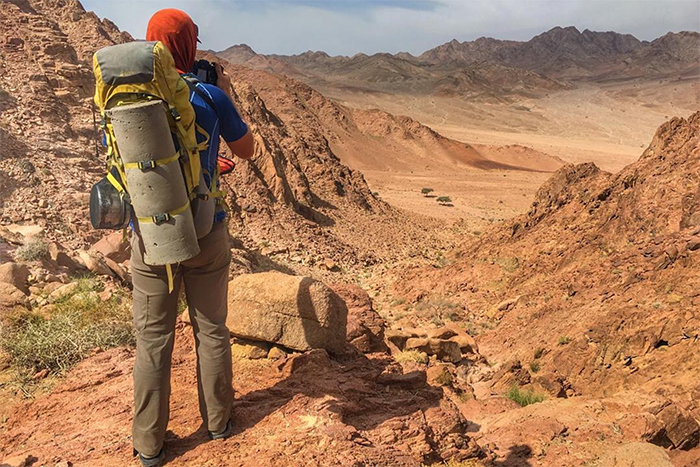 The previous time Leon joined me on my podcast was along with Tom Allen, back in 2015, to talk about the journeys they had made together in Iran and in Patagonia. You can listen to PK Podcast Episode 9: Leon McCarron & Tom Allen On Making Meaningful Journeys, Off The Beaten Track here. 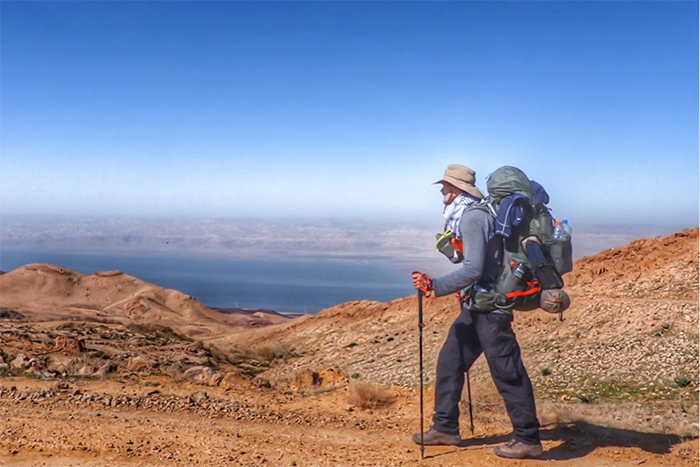 Leon joins me again on PK Podcast 29 to talk about his latest big adventure – walking 1,000 miles in the Middle East from Jerusalem to Mount Sinai. 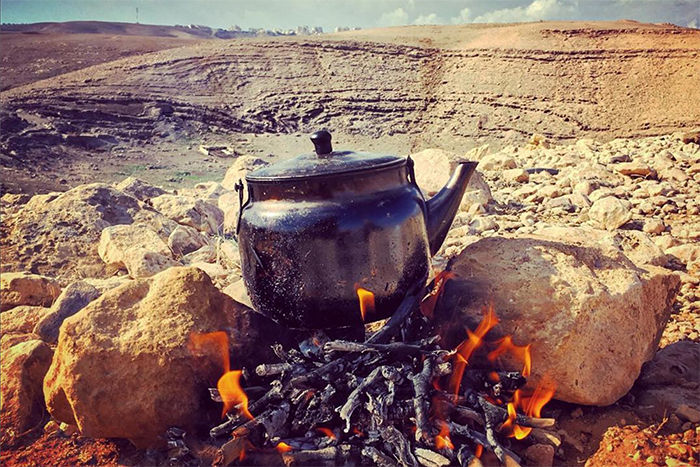 He has written a book, titled The Land Beyond, about the journey and his experiences in this biblical land, which has been garnering a good deal of praise. Personally, I grew to love Leon’s crisp and evocative descriptions of this journey via the longform Instagram posts. I was hooked before the book was ever published. 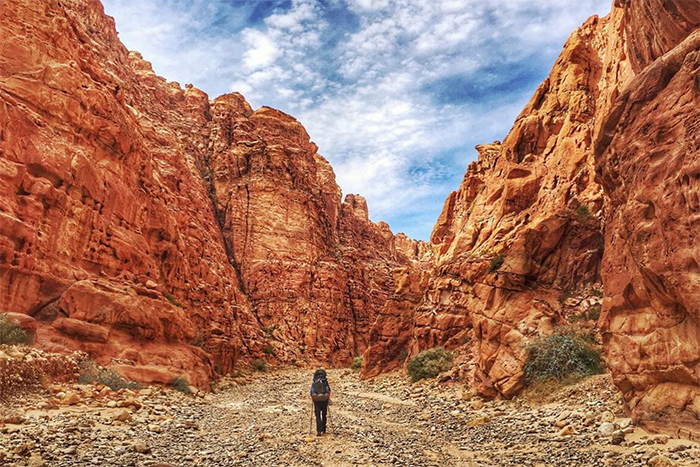 Heading towards the Wadi Rum, the sand becomes softer and the mountains more rugged. Photo courtesy of Leon McCarron. 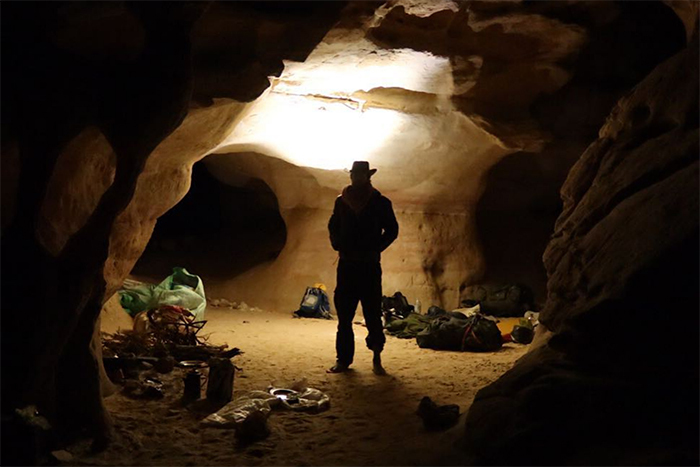 Sleeping in caves. 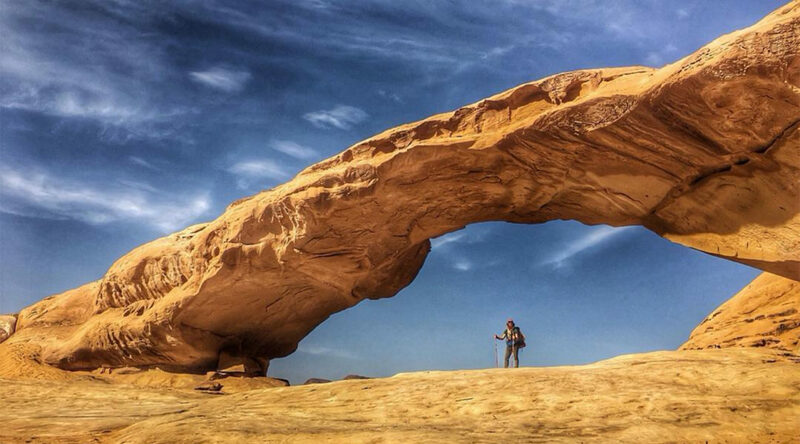 Amazing experiences on the masar. Photo courtesy of Leon McCarron. You can also subscribe on iTunes and on Stitcher, on podcast-only RSS feed. Any good journey involves a liberal amount of tea. Photo courtesy of Leon McCarron. Exploring the land beyond. Photo courtesy of Leon McCarron. Leon McCarron fully loaded on the masar. Photo courtesy of Leon McCarron. Listened today – really enjoyed the interview with Leon and will be searching out the book. Glad you enjoyed it Ian. Thanks for letting me know. Hi Paul, this is a great interview. Really enjoyed it. We are so bombarded with negative information about so much of the world, it was refreshing to hear about Leon’s journey in such a positive light. So interesting. I think travel and getting to meet people from different cultures and backgrounds helps my perspective on things. This interview seemed to agree with that perspective. Enhanced by a well structured interview where the interviewer let the person speak and get their point across, and not jump in with their own opinions or point of view also stood out for me. Thank you. Thanks for your thoughts on this Stephen. Much appreciated. And, of course, thanks for listening.